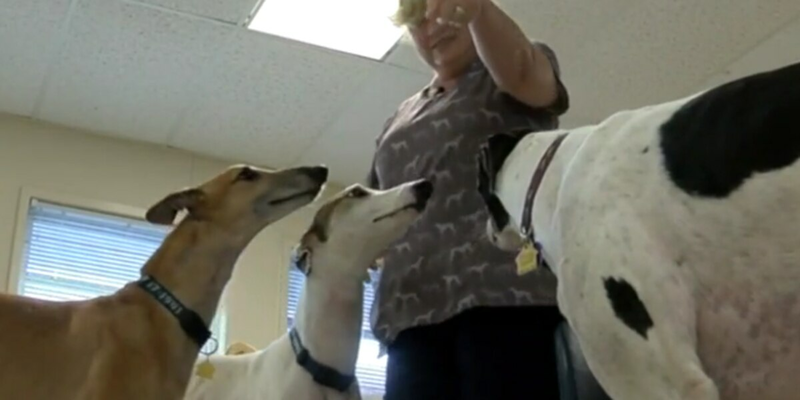 Retired greyhounds are getting a second chance at a better life right here in South Florida. A high school program at South Tech Academy in Boynton Beach is teaming up with the nonprofit, Awesome Greyhound Adoptions, to retrain the dogs as service dogs for veterans. "Tricky here came off the track just a week ago," said vet assistant instructor Carolee Ellison. Ellison has worked with retired racing greyhounds for the past 4 years. "Service dogs work 24 hours a day, that means they get to come to school with me," said Ellison. Ellison has worked to combine her passion for retraining these dogs, with her love for teaching, to create an environment that gives students hands-on experience while also giving back in her community. "There's not very many vet programs like this," said assistant principal Josh Wigelsworth. They spend time learning how to handle the dogs to know if this is even something they would want to pursue as a career. "I'll have more confidence in working with animals," said student Jaime Matheu. However, a significant part of the program is giving back to the community. "They understand and appreciate about what the veterans have done for our country and they understand what working dogs are," said Ellison.